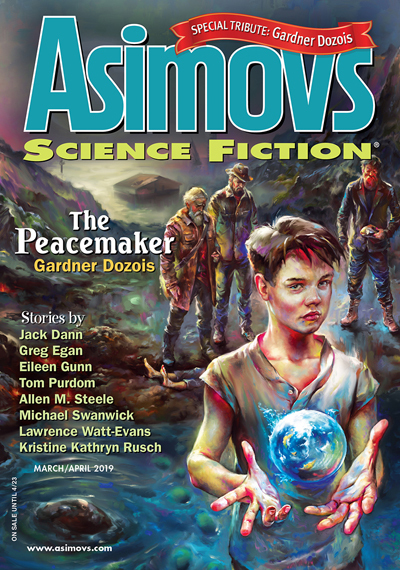 This issue is a tribute to Asimov’s former editor Gardner Dozois and features one of his stories, 1983’s “The Peacemaker” about melting icecaps leading to rising oceans. Several people reminisce about how funny and charming Gardner was. I wasn’t previously familiar with him, but he has more Hugo awards than anyone else, and it sounds like he was both a great writer and editor. This makes me wonder what makes someone a great editor. As with writing, I’m sure it’s largely subjective. Many writers in this issue said he was able to recognize good stories and could help writers fix problematic ones. He convinced a couple writers to shorten their novels to novellas, which I think is a generally good idea. Good writing is more apparent when there’s less filler surrounding it. In addition to the tribute, this issue also features several stories. There’s “Instantiation” by Greg Egan in which self-aware video game characters hiding in a computer network need to find somewhere else to go before the network gets shut down. One of my favorites this issue. “Tourists” by Rammel Chan features aliens posing as humans in Paris and uses the word “whatever” far too much. The aliens mention that they’re going to Amsterdam next and coincidentally, I happened to be a tourist in Amsterdam while I was reading this issue. “Eighteen Songs by Debussy” by Michael Swanwick is a series of vignettes about a hedonistic society in which people routinely switch bodies. “How I Found Harry’s All-Night Hamburgers” by Lawrence Watt-Evans is about a private investigator investigating a strange object. My favorite story this issue is “Terrible Trudy on the Lam” by Eileen Gunn, based (very loosely) on the true story of a tapir in the 1940s who repeatedly escaped from the San Diego Zoo. In this hilarious fictionalized version, Trudy performs at a night club and meets a private investigator while on the lam. “January March” by Tom Purdom is an optimistic sci-fi story about a parade in Philadelphia. “The Starry Sky over the Southern Isle” by Zhao Haihong is about an astronomer living in a future world which is almost always covered in a thick layer of smog, making star gazing particularly difficult. “Transport” by Kristine Kathryn Rusch is about a haunted cruise ship in space. I loved the ending of this one. “Isla Tiburon” by Alex Irvine is a military sci-fi story about mercenaries hunting indigenous people in a world dealing with a shortage of fresh water. “Mr. Death Goes to the Beach” by Jack Dann is exactly what it says in the title: Death takes a stroll on the beach. “The Lost Testament” by Allen M. Steele is about a space detective on a planet with dog-like aliens. “The Lights Go out, One by One” by Kofi Nyameye is about a crew sent to an unexplored region of space on a mission to save humanity who make an unexpected discovery. A great story with a great ending. Another one of my favorites this issue. I’m beginning to notice that Asimov’s likes to publish sequels to stories they’ve previously published (there’s three in this issue). While new readers like me may miss some of the context, it’s a nice treat for long-time readers to get to revisit a world they’ve explored before.